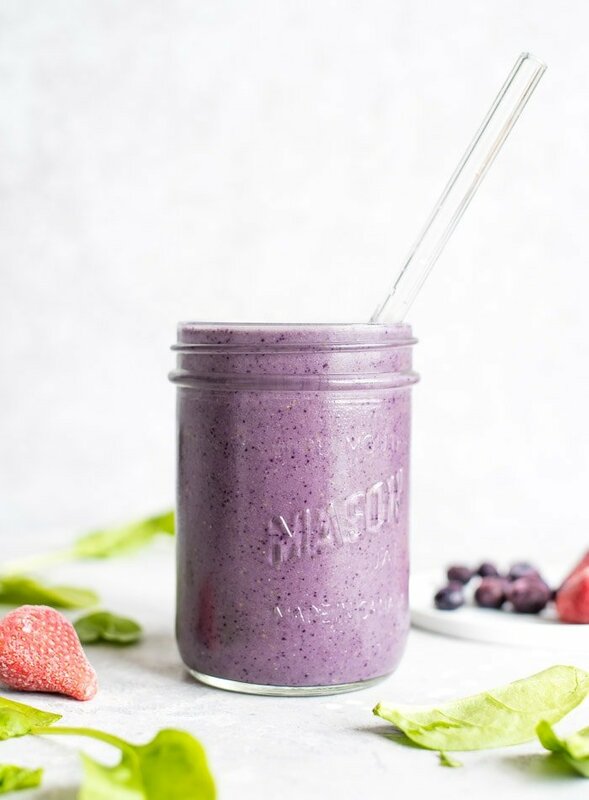 This vegan mixed berry smoothie with almond milk features raspberries, blueberries and strawberries for an antioxidant-rich way to start the day. Frozen banana helps sweeten it up and adds a creamy texture, vegan vanilla protein powder boosts the protein content and the spoonful of almond butter adds healthy fats. Enjoy this delicious, creamy smoothie for a healthy, filling, plant-based breakfast. There are a lot of good reasons to eat berries. They offer protection against cancer, boost the immune system and support a healthy liver and brain. Just like other foods that are brightly colored, the color of those bright beautiful berries means they’re rich in anti-aging, anticancer antioxidants making them one of the best foods you can eat for disease prevention. In fact, as a group, berries contain nearly 10 times more antioxidants than other fruits and veggies. In addition, berries are rich in dietary fiber that we need to support a healthy digestive system, reduce cholesterol and manage blood sugar. Studies on strawberries, raspberries and cherries have suggested that most of the nutrition in berries in retained when they’re frozen so go ahead and stock up when you can. Aside from fresh berry season here in BC, we opt for frozen berries the rest of the year. Frozen berries are perfect for smoothies, banana ice cream, chia jam and oatmeal. I used a mixture of blueberries, raspberries and strawberries but feel free to mix and match any frozen berries up to 1.5 cups. Blackberries or cherries would also be delicious. I like almond butter in smoothies for the creaminess and flavour it adds. In addition, almond butter also contains calcium, zinc, iron, folate, niacin, phosphorus and magnesium. As an alternative to almond butter, you could also use whole almonds or any other nut, hemp seeds, chia seeds, ground flax or even avocado. 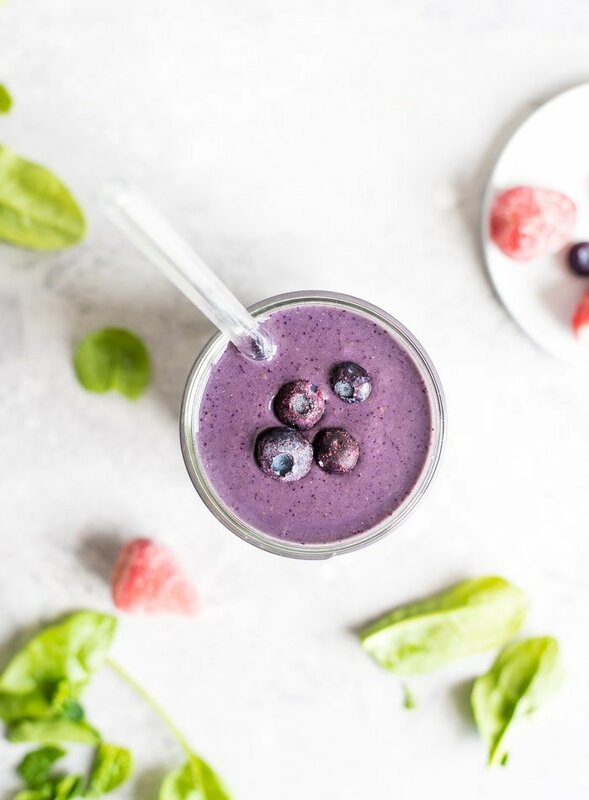 Adding some healthy fats along with the carbohydrates from the berries and banana can help slow digestion resulting in more stable blood sugar levels after drinking this smoothie. And finally, including a source of fat with vitamin and mineral-rich foods can help improve the bioavailability of fat-soluble nutrients. My top pick for this smoothie as an alternative to almond butter would be hemp seeds. Hemp seeds are one of my favourite nutrition boosters. They’re high in essential omega-3 fatty acids, vitamin E, iron, magnesium and zinc, they have anti-inflammatory properties and they add a bit of extra plant-based protein. If you want to try hemp seeds, I’d recommend using 2 tbsp to replace the 1 tbsp of almond butter. 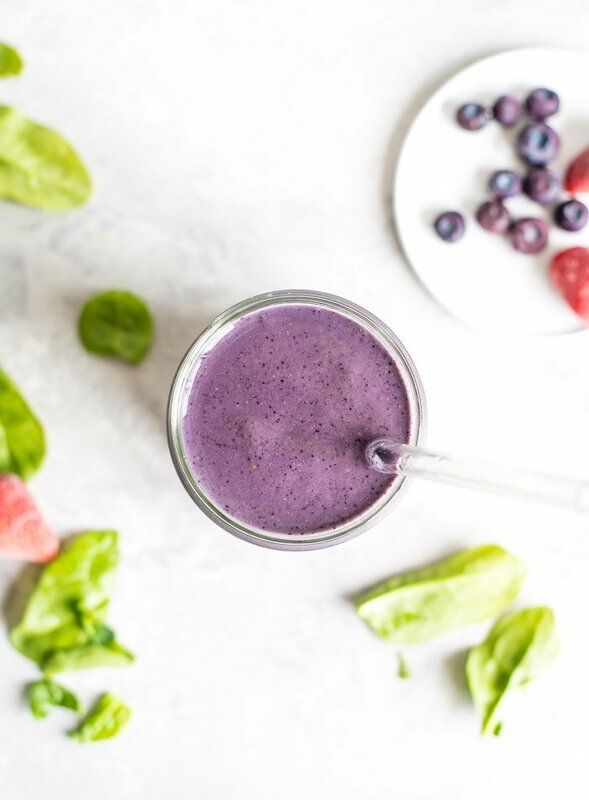 To make this berry smoothie, you’ll need your 1.5 cups of frozen mixed berries plus frozen banana, almond milk and almond butter. Blend it all up, pour it into a glass and enjoy! This smoothie is quite large and almost fills a 1 L mason jar so it’s a good choice when you need a filling breakfast. You can also serve 2 for a snack. Use any nut or seed butter in place of the almond butter. Cashew butter, sunflower seed butter or peanut butter would work well. Use any nut or seed in place of the almond butter. Ground flax, hemp or chia seeds would work well. I would recommend 2 tbsp of nuts or seeds as an alternative to the almond butter. Use any greens in place of the spinach. Kale, romaine or arugula would work well. Use any non-dairy milk such as cashew, oat, hemp or rice milk, store-bought or homemade, instead of the almond. Coconut water also works well. You can also use light canned coconut milk. To use canned coconut milk, I’d suggest using up to 3/4 cup and using water for the rest of the liquid. Reduce the liquid used and enjoy it as ice cream or a smoothie bowl. The frozen banana can be substituted with steamed then frozen cauliflower, zucchini or white beans however I’d recommend keeping it in there for the sweetness and creaminess it adds. 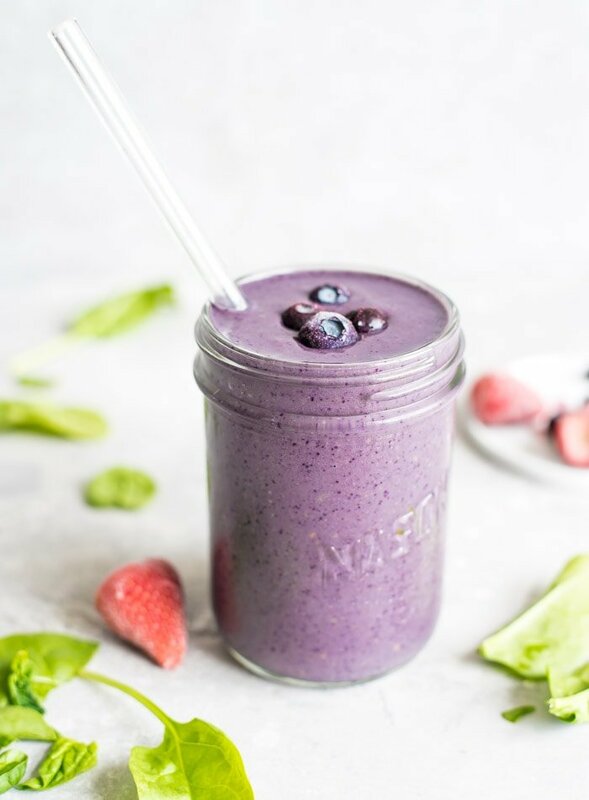 If you add the protein, this smoothie provides 412 calories with 49 grams of carbohydrates, 14 grams of fat and 26 grams of protein. It also contains 16 grams of dietary fiber, half your daily vitamin A, more than your daily vitamin C, 90% of your daily calcium and 40% of your daily iron. 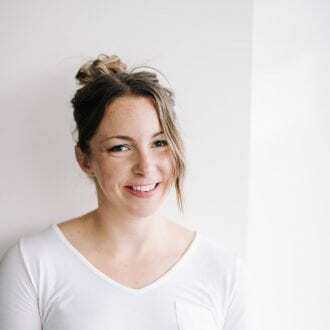 In addition, it’s rich in magnesium, folate, copper, vitamin D, phosphorus, vitamin K, niacin and plenty more vitamins and minerals in smaller amounts. If you leave out the protein it will be 312 calories with 44 grams of carbohydrates, 13 grams of fat, 7 grams of protein and 13 grams of fiber. If you’re looking for more everyday smoothie options, try my Mango Strawberry Smoothie, Mango Pineapple Smoothie, Green Monster Smoothie or Kale Spinach Smoothie. Did you know I have a vegan protein smoothies e-book featuring 66 recipes plus everything you need to know about creating epic smoothies? Check it out here! This smoothie is loaded with nutrition and amazingly thick and creamy. It almost fills a 1 L mason jar so it’s perfect as a filling, plant-based breakfast. Make it your own by going with an alternative nut or seed butter, switching up the greens or using any combination of frozen berries up to 1 1/2 cups. Cherries or blackberries would be delicious too! Add all of the ingredients to a blender and start blending on low. Slowly increase the speed to high then mix until smooth and creamy. Pour into a large glass and enjoy. 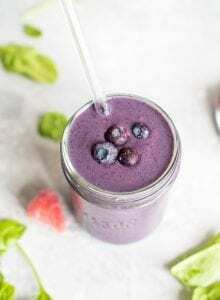 This makes quite a large smoothie suited for one for a meal or substantial snack or it can serve two for a smaller, kid-friendly snack, treat or side to breakfast. This smoothie isn’t super sweet without the vegan vanilla protein powder. It’s still good without it but if you prefer a slightly sweeter smoothie, I’d recommending adding a few dates to the recipe. This can also be enjoyed as a smoothie bowl. To make one, reduce the liquid used to 1 cup then blend on low until you have a thick, ice cream-like consistency. Definitely need to start adding nut butters again to my smoothies! Yes! Nut butters make them soooo creamy, it’s a must! The colour of the smoothie is so appetizing. Isn’t it? And it tastes as good as it looks!